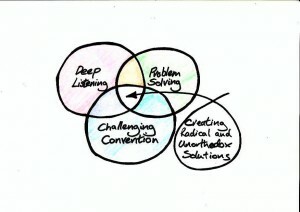 My love of Venn diagrams comes from my background in Product management. It’s sort of compulsory, it’s the way we think. Most of us don’t think about Venn diagrams in relation to ourselves but I did because of a James Altucher post, in which he talks about focus (see point II). The conventional wisdom is to focus on your one “thing”, interest or passion. But what if we have more than one? (Some of us are just like that, we’re scanners). How do we choose between them? James Altucher’s advice is “Don’t”. Choose both. Choose the bit where they overlap because no-one else will be focusing on that space and you can quickly become the go-to person. Overlaps are what Venn diagrams are all about. And this is a creative way to use Venn diagrams, because you can create new overlaps from your different interests. Then it gets interesting because you can ask yourself what, exactly, is in the overlap? So that got me wondering what my venn diagram is. Or are. There could be several. And what overlaps do my interests and passions and abilities create that I can investigate? 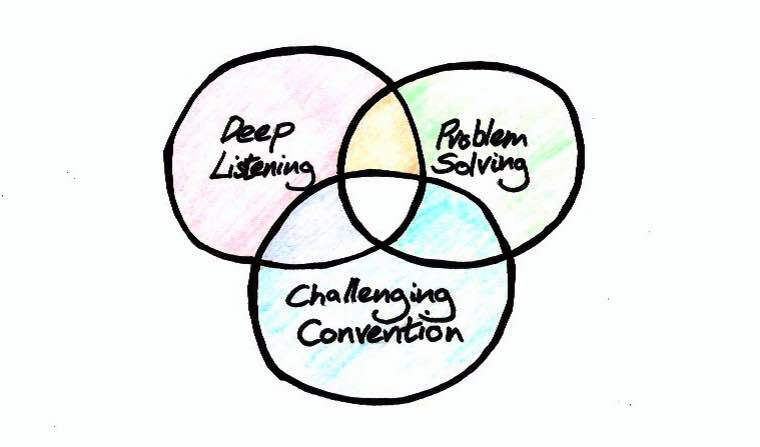 I decided to have a go using the work I have just done on finding my Why, which led me to come up with the three circles shown in the Venn diagram at the top of this post. Firstly, I am a great listener. People have always told me this and it’s a skill I have developed. 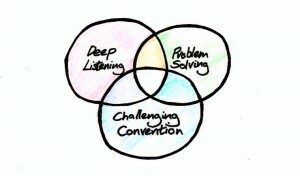 So the first circle in my diagram is ‘Deep Listening’. I’m a problem solver too. I love figuring out solutions, the more chaotic and complex the situation the better. I love finding that simple and elegant way or resolving the conflicting and competing demands. So “Problem Solving” is the second. And I love to challenge the orthodox, the ‘conventional wisdom’, the status quo. I was one of those annoying children who incessantly ask ‘Why?’ and I’ve never really grown out of it. When people justify things by saying ‘because we’ve always done it that way’, I just can’t help myself, I have to look for other ways. I don’t like to follow the herd, my natural contrariness causes me to look for a different route. So “Challenging conventional wisdom” is the third. So what’s in the central overlap? I have come up with ‘creating radical and unorthodox solutions’. I can also fill in the other overlaps, which are my signature skills. I’m going to play with this a bit more. Look at some other interests and create some new overlaps. If you want to find some new approaches, a way to reconcile your divergent interests and create a new and unique opportunity, you could try this as well. What’s your Venn look like? 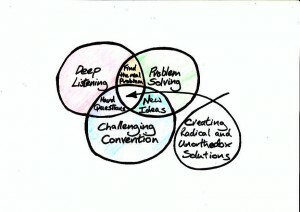 What’s in your overlaps? This entry was posted in Uncategorized and tagged Coaching, Purple Cow, Why. Bookmark the permalink. Post a comment or leave a trackback: Trackback URL.